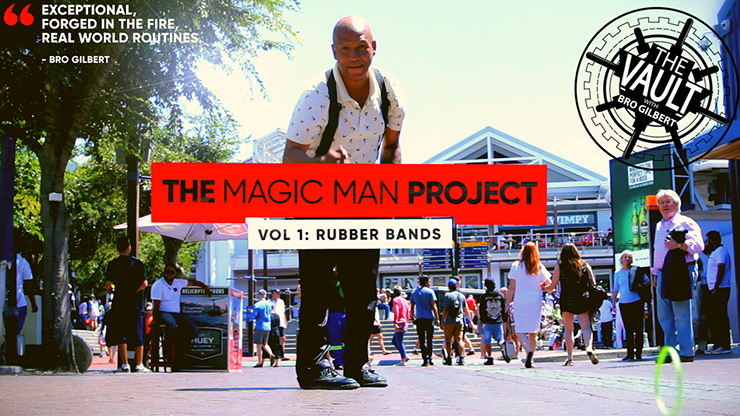 Today, when you order "The Vault - The Magic Man Project (Volume 1 Rubber Bands) by Andrew Eland", you'll instantly be emailed a Penguin Magic gift certificate. You can spend it on anything you like at Penguin, just like cash. Just complete your order as normal, and within seconds you'll get an email with your gift certificate. The main feature of this download is the boomerang band, which Magic Man explains in the context of a short routine. However, he also explains a second routine which is really, really good. His touches on the penetrating bands/crazy man's handcuffs make his version the most convincing I have ever seen. There is also a great 'moment' when a knot moves along the rubber band. The routine flows smoothly (each step is 'well-motivated'), and it ends with the production of a coin. Magic Man says that he uses these short routines to attract a crowd before segueing into his coin magic. You can tell he has done these routines hundreds or even thousands of times. These routines are perfect for a walk-around or street performer, or even just for an amateur in a casual setting. Packs small, plays big and resets. The video is shot really well, and you get both real-world and in-studio performances. The explanations are shot in-studio and are clear and detailed. The whole download is about an hour, and is amazing value. Finally, a personal anecdote: I actually once saw Magic Man perform the boomerang band live on stage in the 90s. It played huge, and the crowd loved it - in fact it is the only thing I remember from that show, almost 20 years later (and there were several other performers). He can do it under fire in front of hundreds of people. It says volume 1 - I can't wait to see more of his magic!